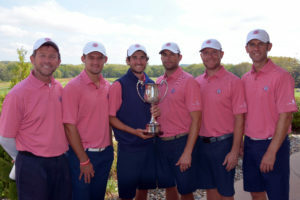 The Nebraska Golf Association participates annually in the Kansas-Nebraska Junior Cup Matches and the Nebraska Cup Matches, and biennially in the Directors Cup Matches. These are select team events featuring the best amateur golfers in the state. Players are selected using the NGA Point Standings system. Link to the appropriate item below to learn more. 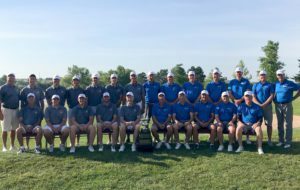 The Kansas-Nebraska Junior Cup Matches pit the top eight juniors from Nebraska against the same from Kansas in Ryder Cup-style matches, with history dating back to 1986. The competition begins with Foursomes and Four-Ball matches and concludes with eight singles matches. Each match is worth one point. 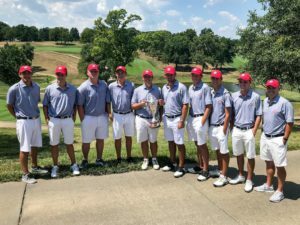 Nebraska won the 2018 matches, 10-6, to reclaim the Cup after Kansas had won seven straight years. Kansas leads the overall series 19-14. 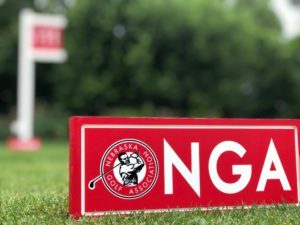 This goodwill competition pits a 12-man squad representing the Nebraska Golf Association against a squad from the Nebraska PGA in Four-Ball and Singles Match Play competition. Each squad includes four (4) senior golfers. The PGA leads the overall series, 26-20. This goodwill competition is staged every other year and consists of round-robin Four-Ball, Foursomes and Singles matches between teams from Iowa, Kansas, Missouri and Nebraska. The most recent competition was hosted in 2017 by the Iowa Golf Association with the Missouri Golf Association set to host the event in 2019.